The all new X1D takes the well-regarded 50MP 43.8 x 32.9mm CMOS sensor found in numerous medium format systems and incorporates it into a revolutionary mirrorless camera body. Designed and handmade in Sweden, this camera is a precision tool with exceptional ergonomics and a compact size that even rivals smaller format systems. It is capable of capturing clean images within a sensitivity range of ISO 100-25600, while also being able to capture photos at a rate of up to 2.3 fps. 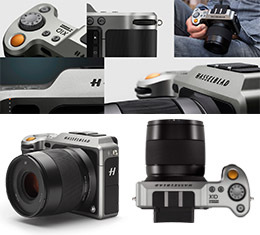 Moving a bit beyond pure image quality, the X1D embraces the Hasselblad Central Lens Shutter, enabling shutter speeds as long as 60 minutes or as short as 1/2000 second, with flash sync possible at every speed. Additionally, to make the camera more versatile, Full HD 1080p video at 25 fps using H.264 compression is possible. Video Highlight Features: At less than half the weight of a conventional digital medium format camera, the mirrorless X1D is a game changer in the world of photography.